The stitch for week 4 is to learn and experiment with Stem Stitch. Stem Stitch is a basic quick and easy linear stitch, which I personally think is one of the most useful stitches there are. 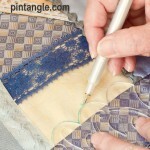 You can use this stitch to outline just about anything, and it is great for lettering as it will hold a curve well. If you find it looks a bit baggy, or loose make smaller stitches as you move around the curve. The above sample is actually quite small – as each stitch is just a bit bigger than a seed bead. You can see how the stitches define a tight curve without getting too messy. It’s a stitch that beginners will find useful and yet it is not a huge challenge to learn. As always, follow the link to a step by step tutorial for stem stitch and eye candy and have fun! The stitch this week for the Beyond TAST challenge is Portuguese Stem stitch. This is a textured linear stitch that is best worked in a thread with the firm twist. It needs a bit of body to sit proud against the foundation fabric. Portuguese Stem stitch is an interesting stitch that follows a curve well. I think experienced stitchers will enjoy it. I am looking forward to seeing what people do. 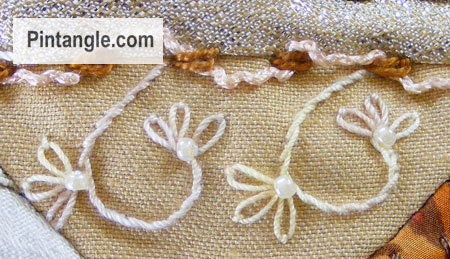 As usual, you can find a tutorial for stitch Portuguese Stem Stitch in my Stitch Dictionary. Stitch a sample, photograph it, put it online on your blog, or share it in the Take a Stitch Tuesday Flickr group, or in the TAST facebook group or wherever you hang out online. Hashtags are #TASTembroidery and #PintangleTAST on places like Instagram etc. If you have a blog leave a comment on the stitch’s page with your full web address. As someone who loves crazy quilting and embroidery, I designed these templates with other stitchers in mind. With my templates, you can create hundreds of different patterns to apply to your stitching and crazy quilting projects. They are easy to use, totally clear so you can position them easily and they are compact to fit neatly in your sewing box.